Many disease states are associated with regional or systemic hypoxia. The study of healthy individuals exposed to high-altitude hypoxia offers a way to explore hypoxic adaptation without the confounding effects of disease and therapeutic interventions. 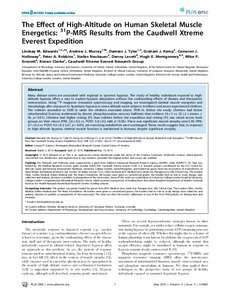 Using 31P magnetic resonance spectroscopy and imaging, we investigated skeletal muscle energetics and morphology after exposure to hypobaric hypoxia in seven altitude-na�ve subjects (trekkers) and seven experienced climbers. The trekkers ascended to 5300 m while the climbers ascended above 7950 m. Before the study, climbers had better mitochondrial function (evidenced by shorter phosphocreatine recovery halftime) than trekkers: 16���1 vs. 22���2 s (mean���SE, p�<�0.01). Climbers had higher resting [Pi] than trekkers before the expedition and resting [Pi] was raised across both groups on their return (PRE: 2.6���0.2 vs. POST: 3.0���0.2 mM, p�<�0.05). There was significant muscle atrophy post-CXE (PRE: 4.7���0.2 vs. POST: 4.5���0.2 cm2, p�<�0.05), yet exercising metabolites were unchanged. These results suggest that, in response to high altitude hypoxia, skeletal muscle function is maintained in humans, despite significant atrophy.